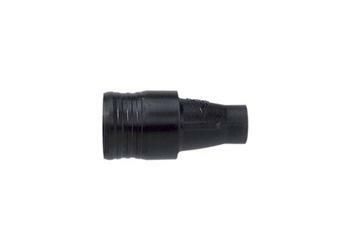 Low cost, lightweight depth locator for Milwaukee 6790-20 Self-Drill Fastener Screwdriver. Acetal resin formulated for maximum toughness. The patented ramp-off locator has depth adjustment designed for the professional. The positive indexing nose is indexed in 1/64 inch increments per two clicks of the index tabs. Rotate the nose to the right to set the fastener deeper. Rotate the nose to the left for a more shallow setting.